End your day with a steak or seafood on the grill. While sounds of the river and the breath taking mountain views soothes you, roast some marshmallows or s'mores around the campfire. Take in the beautiful sunsets with the geese and ducks flying in for the evening. The Shenandoah National Park/Skyline Drive and the George Washington National Forest is a wonderful way to view the Virginia wildlife only 10 minutes away. Massanutten Resort “A Four Seasons Resort” and the Massanutten Water Park are only 10 minutes away all other attractions are approximately 12 to 20 minutes. We look forward to your visit and hope you enjoy your stay with us! 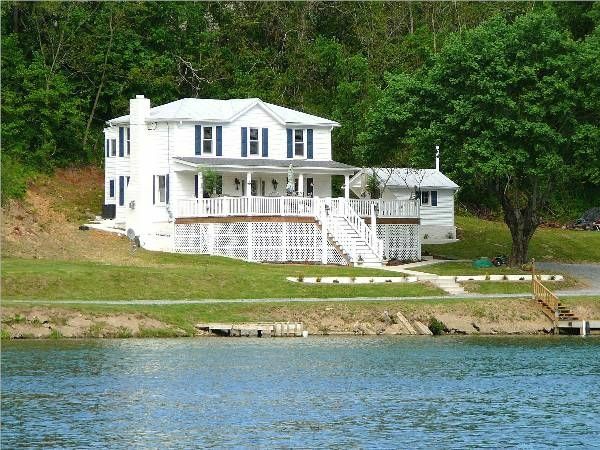 Two deep water boat docks in front of the home, Four plasma TV's, private river access in the front of the home. Outdoor Hot Tub overlooks the beautiful Shenandoah River. The view was exquisite. I didn't realize there was only one bathroom upstairs. It was little smaller than I anticipated. It was very cozy though and place was pretty clean! We had a great time fishing, flying kites, and the hot tub! One of the nicest and best stocked houses we have stayed in. Unpack your suitcase and enjoy! Had a couple of issues, but the owners (while on their own vacation) were extremely responsive and even called in favors to get everything resolved within a few hours. While the location of this house didn't really fit what we were looking for, I wouldn't hesitate to rent any of their other properties in the future. Small for the price, too many instruction for checkout. (Mop , sweep, put the dishes away). Thank you for saying that the house is cozy and in a great location. The house has three bedrooms, 2 full baths, living room, dining room, eat -in kitchen with bar, large deck and patio, we are sorry that you felt the house was too small, we have been renting the house 9 years and this is the first compliant that we have had the the house is too small. After guests check out at 5 of our luxury properties, we have a professional cleaning staff that comes in to get the property ready for the next guests. Our instructions reads as sweep/mop up any dirt, mud, food or spilled items on floors and to empty the dishwasher, our properties are directly on the waterfront where kids and adults sometime get their feet muddy and wet from the river banks, so what we are asking for is not to clean the house, but also don't leave mud and spilled drinks laying on the floor because it can damage our hardwood floors and granite tile. We thank you for coming and we hope that you come again to one of our 5 Luxury Vacation Properties that we own. NOTE: Base Rate is for 2 Guests...Extra Guest $25 Per Person/Per Night. We do verify the number of guests during your stay. Please see the contract agreement for details regarding additional guests not accounted for on the reservation.